Powered by a single D-battery, the Instant Replay player resembled an over-sized transistor radio. Mattel shipped four single-sided records with each player. At about 2.5-inches in diameter, the discs mirrored the form and function of larger vinyl records of the day. Each disc had a sticker with an athlete’s image on one side and a grooved recording on the other. To hear the play-by-play audio, kids popped the record into the player (with the grooves facing speaker-side) and were rewarded with roughly 30 seconds of audio playback of a key moment in sport. A replay button allowed them to listen to the moment over and over again. 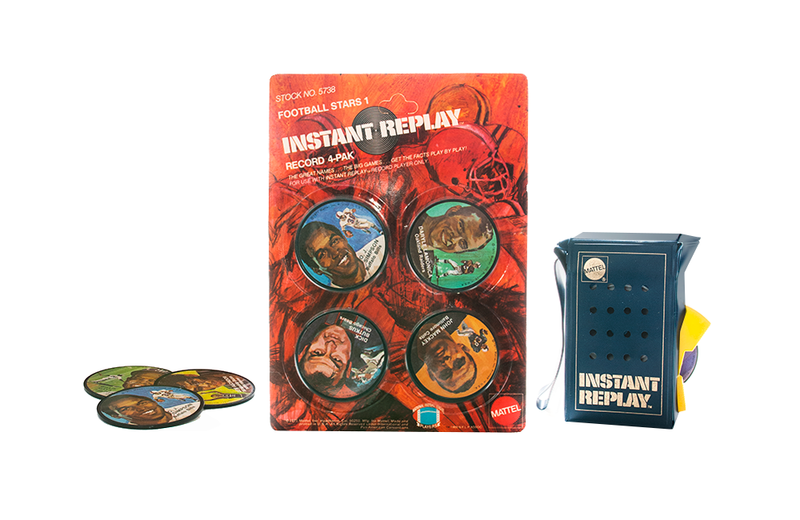 Mattel’s Instant Replay record library covered all the major sports, including football, baseball, basketball, “speed machines” (cars, motorcycles, planes), and eventually hockey. The company shipped additional records in four-piece sets as well as eight-disc collector’s albums, complete with a booklet. Over the toy’s roughly three-year shelf life, Mattel issued two versions player: a blue version and one in red that was modified to include a handle.